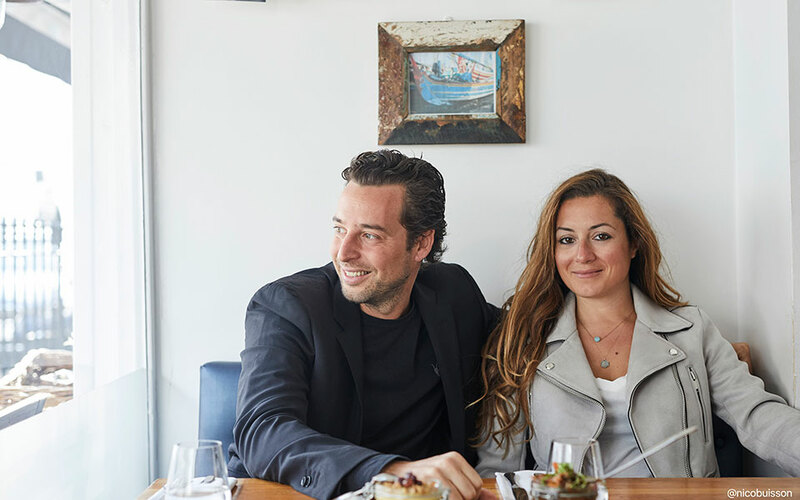 Adrien Carré and Christina Mouratoglou, founders of Mazi. 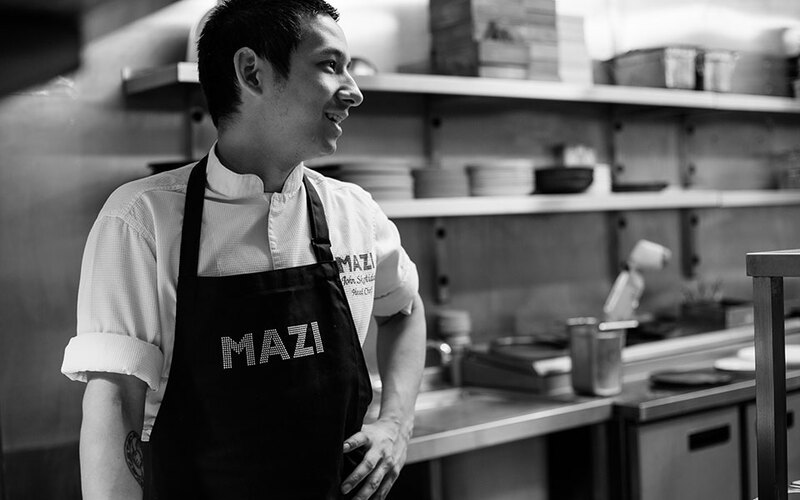 We opened Mazi, with Adrien Carré, in London’s Notting Hill in June 2012 with a mission to change people’s perception of Greek food. Until that time, Greek restaurants in London had been stuck in the past, showing little creativity and innovation. As a Greek foodie, it had always upset me that there wasn’t a restaurant I could recommend when friends asked me where to find some decent Greek food. So we came up with the concept of Mazi, a thoroughly modern Greek restaurant. Mazi, which means “together” in Greek, references and revives Greece’s noble sharing tradition. But while we draw inspiration from customary practices and childhood memories, we reinterpret them with a modern twist. A perfect example would be one of our most popular dishes, Cool Souvlaki, which has appeared in many different versions over the years, sometimes with a southeast Asian twist, sometimes with a Mexican take. The souvlaki at Mazi is served in tortilla bread, with cumin yogurt, thin strips of cucumber, tomato marmalade, finely sliced onions and coriander cress. So one sunny day, on a break between services, as we were all sitting at a big table in the garden and enjoying some unbelievably good homemade gyros, I said to our chef, John Skotidas, “Come on! We have to put this on the menu! People will love it.” As I expected, he rejected the idea at first, but, after some serious lobbying by both my partner, Adrien, and me, he agreed to come up with something shareable and “cool” enough to go on Mazi’s menu. John Skotidas, the chef at Mazi. 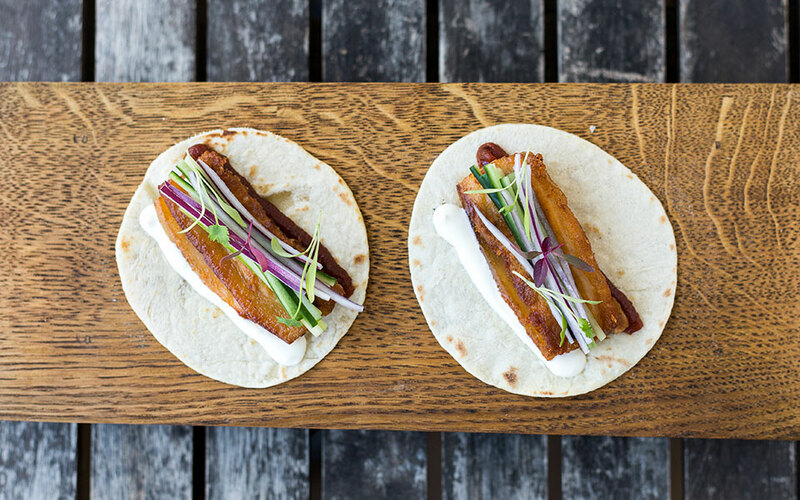 Inspired by the current London trend for tacos (they’re the new bao buns), we decided to create individual tacos that taste like souvlaki. First off, we replaced the pita bread with a thin, soft handmade tortilla. Then we used pork belly, as it most resembles the taste of pork gyros. We bake the meat in the oven for four hours and then use a frying pan to give it that glossy and crispy outside look. Instead of tzatziki, we use cumin yogurt and thin strips of cucumber. We add tomato marmalade, finely sliced onions and, for the final touch, some coriander cress on top. It looks like a Mexican taco with Asian notes but once you fold it up and put it in your mouth, the taste kicks in: Greece at last! Recipes for Lent: Have you tried Greek Pancakes?